Since his PhD in 1973, Juerg Huber´s scientific work was dedicated to the development and application of baculoviruses for control of pest insects in agriculture, horticulture and forestry. Under his direction the Cydia pomonella granulovirus (CpGV) was registered in Germany and became an unprecedented success story of commercial use in organic and integrated apple production. He developed and improved the methodology for virus bio-assaying. He worked on the biological characterization of different baculoviruses and was involved in several international collaborations of biosafety research of genetically engineered baculoviruses. In recent years he focused on field resistance of codling moth against CpGV, a topic he explored already during his PhD thesis at the Swiss Federal Institute of Technology in Zuerich in the late 1960s. 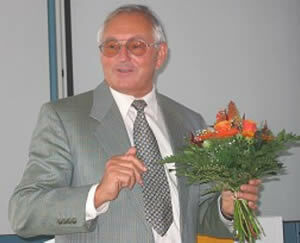 Dr. Juerg Huber worked for 36 years at the Institute of Biological Control of the Julius Kühn- Institute and from 1991 to 2009 as its Director. Juerg Huber served for numerous scientific organisation and committees, always with the objective to enhance the implementation of biological control measures in integrated control. He was founding member of the IOBC/WPRS Working Group on Insect Pathogens and Insect Parasitic Nematodes in 1985 and served for the IOBC in different functions as Working Group Convenor (1989-1991), Treasurer of IOBC/WPRS (1989-1997), Vice President (1997-2005) and Council Member (2005-2009). He was also Vice President (1996-1998) and President (1998-2000) of the Society of Invertebrate Pathology (SIP). Juerg Huber´s scientific accomplishments include more than 200 journal publications, book chapters and conference contributions. He mentored numerous PhD students and Postdocs who are now active all over the world continuing his fruitful and important initiatives in implementing biological control. In 2009 he was appointed President of the German/Austrian branch of the International Biocontrol Manufacturers' Association (IBMA). For his research on the development of microbial control agents Juerg Huber was awarded the highly prestigious Karl-Escherich-Medal of the German Society of General and Applied Entomology (2005). In 2011 he was nominated for the International Plant Protection Award of Distinction (IPPAD) of the Association for the Plant Protection Sciences (IAPPS) for his life-time achievement in the development and furtherance of biological control and his significant contributions to baculovirus research.